Listen to my interview with John Stevens and Matt Vaudrey (transcript). If you’ve been looking for a boost of inspiration lately, something to help you engage students deeply and make your teaching fun again, then I have just the book for you: The Classroom Chef, by Matt Vaudrey and John Stevens. Here’s the premise: If we want our lessons to have a long-lasting impact on our students, if we want to make our content really relevant, we need to design instruction the way a chef orchestrates a good meal, from appetizer all the way to dessert. And like any accomplished chef, we will only get really good at it if we take risks, experiment, and are willing to fall flat on our faces. In the book, Stevens and Vaudrey show us how they learned to do this in their math classes. Although the examples are all from math, and math teachers are going to absolutely LOVE this book, it’s easy to imagine how the same kinds of lessons could be prepared in any subject area. Non-math teachers who skip this book will really be missing something special. Here’s a run-down of some of the book’s best ideas. This was my biggest a-ha from the book. Too many teachers treat their instruction the way a college student approaches food, going for the easy, pre-packaged, processed stuff—in other words, worksheet and curricula straight from the textbook companies—rather than preparing lessons with more thought. Stevens and Vaudrey concede that preparing thoughtful lessons takes a lot more effort, and some of your attempts will bomb in the same way new recipes can fall flat. Still, the level of student engagement and learning you’ll get from these efforts will ultimately pay off. Although this is not a new concept, and I have written about the value of good anticipatory sets before, Stevens and Vaudrey’s approach to “appetizers” makes them a truly integral part of the lesson, a way to hook students into the day’s learning that goes beyond merely getting their attention. Hey!! This is not an ad. It’s a math lesson! In this appetizer, students need to pick a wireless plan. Making this decision requires choosing which math strategy to use, then applying it in order to justify their choice. By arguing for their particular preference, students are engaging deeply with math in a way that applies directly to a situation they might actually find themselves in someday. The entrée is the real substance of the meal: the main lesson. This is where the learning goes more in-depth, where students work with the standard you intend to teach them…except they may not know what that standard is for a while. That’s because rather than simply providing direct instruction on the content, a good entrée delivers it in a context students are actually interested in. “We would much rather students have a meaningful experience in class than restate a standard,” the authors write. Stevens and Vaudrey walk us through lessons like this one and several others, like Barbie Zipline, Big Shark, and the lesson where students build a scale model of the Twin Towers to honor the memory of the September 11th attacks. By reading about each of these lessons and the thought process that led each of the authors to develop and teach it, readers will be able to apply the same thinking to their own content and prepare delicious, satisfying entrées of their own. The problem with the one-size-fits-all assessment is that it doesn’t do a very good job of assessing, and it also doesn’t fit all students. If we assign some kind of poster, where students are graded on the standard AND on things like creativity and presentation, we have two problems: (1) the grade doesn’t necessarily measure standard mastery, and (2) any student who’s not great with poster-making will automatically be at a disadvantage, even though poster-making isn’t the skill being measured. A restaurant patron can review their experience instantly by going to sites like Yelp. Once these are written, the restaurant owners can read the reviews and make improvements accordingly. We should give our students that same opportunity by seeking their feedback. Stevens and Vaudrey share their system for having students complete a Teacher Report Card to give feedback, and what they do with the information once they’ve gotten it. Matt Vaudrey blogs at mrvaudrey.com. You can find him on Twitter at @MrVaudrey and at classroomchef.com. and delivers a weekly parent newsletter on math at Table Talk Math. Find him on Twitter at @Jstevens009 and at classroomchef.com. 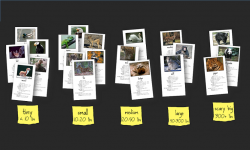 Amazon Affiliate Links: The links to Amazon in this post are Amazon Affiliate links, which means if you make a purchase after going to Amazon through them, I get a small commission at no extra cost to you. Thanks for your support! p.s. I love food metaphors, too! 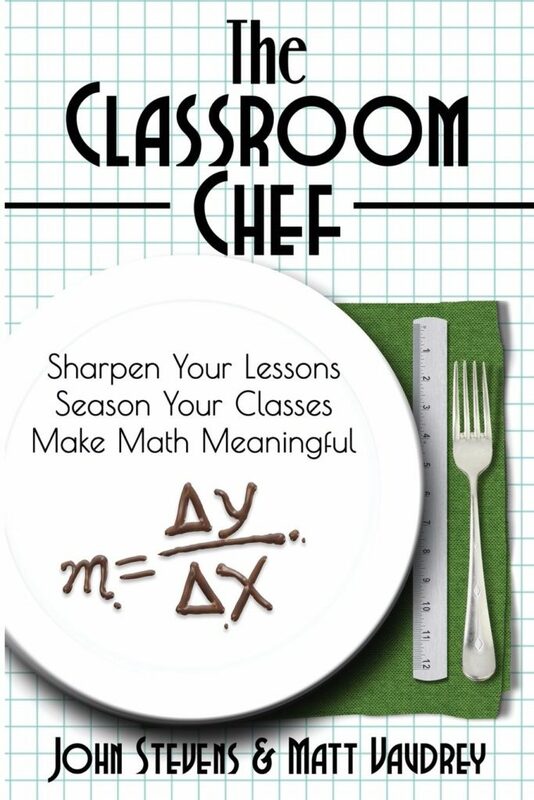 This concept of treating math education like a master chef is ingenious! I started to think about what my lessons have been like during my practicum in the school year, and during my previous summers teaching in a lower socioeconomic neighborhood. I’ve definitely been treating math as processed food many times because I want to follow what the textbook says, and try not to stray away from it. However, there is so much to math that can be expanded upon, even from a textbook. The example of using whose hair is more mullet-y is a great way of teaching ratios, and it allows students to see something so silly being used in math. Also, a question regarding feedback: What are some of the ways you receive feedback from students after an assessment(s)? I’m curious because of the edTPA that I will be doing in the spring semester, and it would be great to know creative ideas for feedback. Matt and John give students a questionnaire a few times a year, but you’re specifically mentioning after an assessment. So are you talking about getting feedback about that specific task/assessment? I listened to this podcast in the Fall and loved the idea of Choose Your Own Assessment! So I went off and created an assessment for my 7th grade Social Studies “Creativity” unit using this concept. It was a huge success. I created a video showcasing this approach and some of my students results. Highly recommended. Thanks again!